My wife and I spent the better part of our adult lives residing in a part of Lower Manhattan in buildings that existed on or between Canal and Grand Streets. This neighborhood is the heart of what has become to be known in the annals of New York History as Little Italy and Chinatown. Two very strong immigrant cultures that have found a way to coexist for years and have ultimately blended into a subculture all its own. Before there was a NoLita or a TriBeCa, the dreaded acronyms that raised the rental prices in the neighborhood, this area was simply Chinatown and Little Italy. It, having been my neighborhood for many years and one my family and I often visited throughout my childhood, It is easy for me to overlook the fact that this neighborhood may be the most unique in which to find, what I like to call, “quick eats”. Places that one can run in and get their fill with little to no fuss, but please don’t confuse these experiences with that of fast food. I’m going to concentrate on Chinatown today, and share with you some finds that have been dear to me and may not be frequented by many that aren’t locals. Here is my list of places that need to be visited and a list of treats that need to be tasted. Don’t expect a smile as you enter. You’re made to feel as if a requirement to work in the establishment is to be taciturn. At some point upon your entry, you’ll get pointed to an open table. With some irony, the staff is uniformed in colorfully happy Hawaiian button down shirts. A menu will be thrown onto your table, along with forks, because if you don’t look like someone from the mainland, they assume you wouldn’t know how to use a chopstick. Before you can even scan the menu, they’ll ask you in an idiomatic English with a tinge of Lower East Side cadence, “What you want?”. I usually know what I want to order, but I like to piss them off a bit and tell them I need another minute. I will then call the waiter over just as he gets far enough to tell him, “I know what I want.”. At this point, I will also ask him for chopsticks. It’s a game in which I have played a part for the better part of 3 decades. My order, the usual – Cantonese wonton noodle soup with roast duck. This is not the ubiquitous option found on many menus that are dropped off at your office or slid under your door. It doesn’t come with strips of “crispy wonton” encased in small wax paper bag with a side of duck sauce to dip. This is different. This, unfortunately for me, is also the game changer. The one item that puts me on the losing side of the game I play with the waitstaff. Ultimately they win with this dish. I am always so delighted by its depth and warmth, that at the end, I can’t help but overlook, forgive them if you will, their shortcomings. This is a true example of one good thing outweighing all the bad. The broth used in the dish is riddled with flavors that can only be attained by the use of the much misunderstood, MSG; the wonton is made with a mix of finely minced pork and shrimp, along with mild seasoning, tightly wrapped in wonton skin. This, along with thin flour-based Cantonese noodles is dipped in a cauldron of water that continues to boil all day and labored over by one man. Just about everything on the menu is cooked in this water. The execution is simple, yet has very precise timing. From the cauldron, the slightly softened noodles and still firm wontons are put in a bowl along with some vegetables, which are also blanched in the same water, followed by adding of a series of-of sauces and essences, which I cannot discern. The duck (room temperature) is introduced to the bowl, then the final step, the pouring of the very hot broth on top. The items continue to cook in this broth and the flavors start to mix. As if that weren’t enough, there’s a nice offering of condiments that complement the dish. I prefer a dash of white pepper, some red wine vinegar, and the piece de resistance – “hot oil”. This is not to be confused with the commonly found hot sauces and chili pastes. This is oil infused with spicy chili flakes. I use a healthy portion of the oil and the actual flakes that sit at the bottom of the plastic container. I like to take a bit of soup, followed by noodles. I dip the duck a bit in the hot broth to warm it and watch the fat separate from the glistening brown skin. Taking a bite automatically transports me to the streets of Mongkok where the act of chopping roasted meats by butchers is ubiquitous. The second sip of the hot liquid, is always a bit spicier, as it takes to the “hot oil”. Then I take a whole wonton into my mouth, bite into it and close my eyes trying to figure out what makes the little morsel so distinct. I’ve been doing this for the better part of 45 years and I still don’t know what makes it so special. 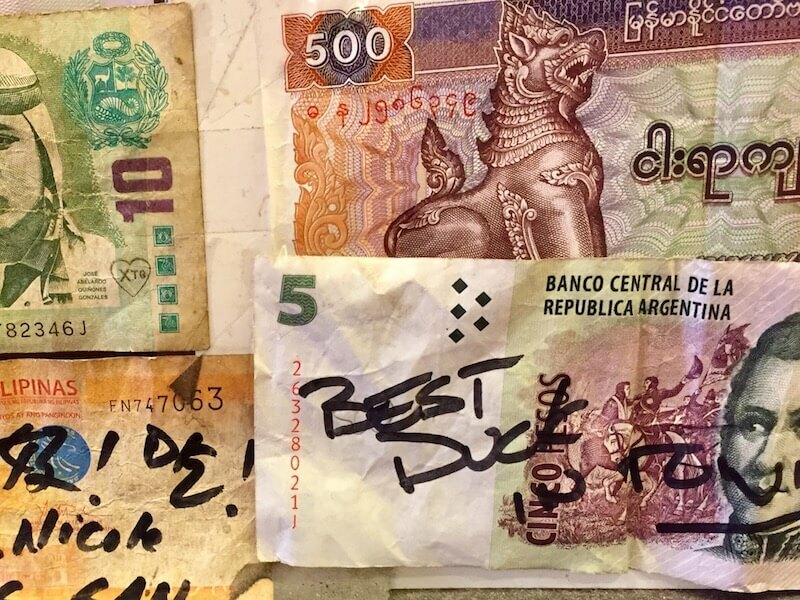 There is paper currency from all over the world pasted onto the walls; with most having written on them accolades toward the food. It certainly isn’t for the service. I pay, thank them in a rather abrupt way, receive a smirk and turned up look as they shove my bills into the register and slam it closed. I leave sated and smile. I wouldn’t have it any other way. Get yourself to “Wonton Garden” and play along. If I were to pick a Chinese equivalent to a pasty or meat pie, it would have to be the “Roast Pork Bun”. 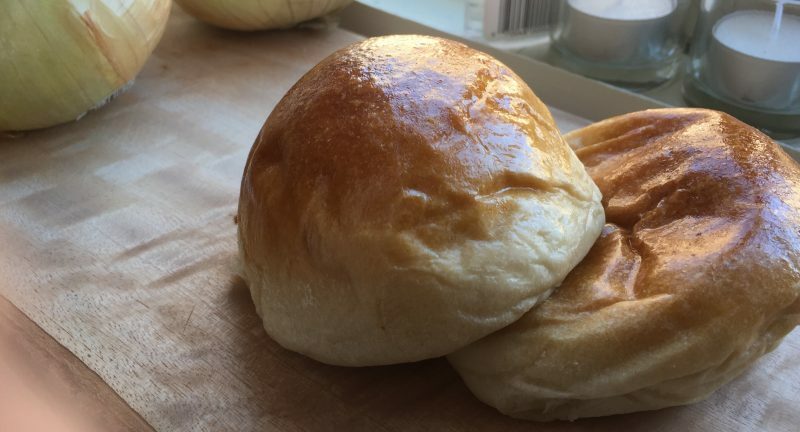 Recently, “Bao” (steamed rice cakes stuffed with slow cooked meats) is having a moment. 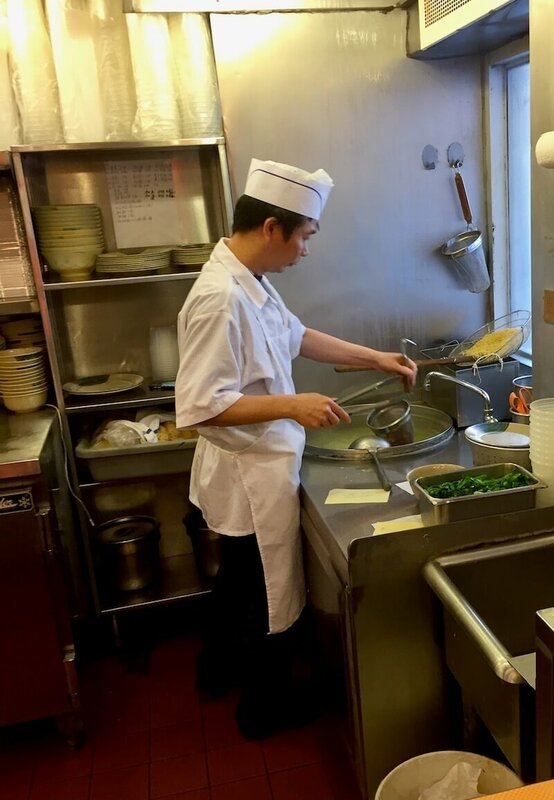 However, what is served at Mei La Wah on Baxter Street is truly Old School. The buns here also have Old School prices as they are still at only $1 each, unlike the bao counterparts that are now ubiquitously being dished out of fancy food trucks and “of the moment” eateries. The line usually floods outside its doors, and there is always a bit of panic on people’s faces when they see others who have been fortunate enough to have gotten there before, walking out carrying white boxes filled with these buns. They never run out, this place is a well-oiled machine. 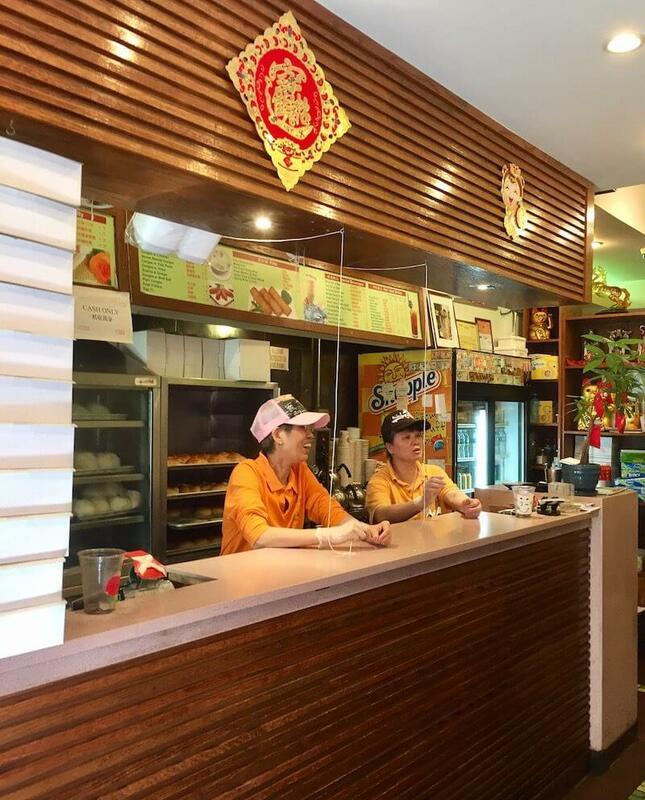 Once inside, the women up front, dressed in their orange polo’s, are almost always cheerful and quick to fill your order. Behind them are trays of buns; being packed to fill orders as quickly as they arrive. I prefer the baked version. The well-marinated pork is baked inside a semi-sweet bread casing. Few food offerings capture the “Yin-Yang” popular in Asian Food culture as this does. The exterior is brown with a glistening surface, and the interior, an almost fiery red roasted pork mix. Unlike many beef patties, the pastry is not of the flaky variety – it’s soft. When warm, the sweet aroma of the bread makes one’s mind think that it’s about to taste something of the sweet variety; and it’s right, but only halfway. Once a bite is taken, along with the sweetness of the bread is a wonderful savoriness from the pork mix. It is instantly satisfying. I cannot equate a flavor profile; but if I were to, I’d say that it’s like having a bite of a semi-sweet brioche followed by a bite of St. Louis barbecued ribs. Hard to have just one, so I often purchase a dozen to take home and usually end up dipping into the box to have one while still warm. About a couple of decades ago, my brother and I worked together at a clothing boutique on Elizabeth Street, just a few blocks north of Chinatown. At the cusp of where Chinatown starts merging into Little Italy on Mott Street, existed a shop that sold Jade. Within the same shop, was a small back kitchen in which Vietnamese sandwiches (Banh Mi) were being made and sold. We would take a walk together to this hole in the wall and buy our lunch amongst a crowd that was predominantly made up of what seemed to be old Asian ladies with push carts. It was worth battling them to get to the front of the counter to put through our order with the skinny guy with a big smile. The sandwich at the time was at the whopping price of $1.75. Vietnam as a country, for better or worse, has one of the more unique food cultures in Southeast Asia due to its colonial days under the French. The Banh Mi is a true hybrid of two strong food cultures. The bread used for the sandwich is a baguette. Not a classic baguette, it’s a little less flaky and a bit softer in the middle, but a baguette nonetheless. On the sides of the baguette are smeared paté on one and butter on the other – very French. The Vietnamese contribution comes through with vegetables pickled in vinegar, sugar and fish sauce, topped with some fresh cilantro. Then there are the meats which fill the frame at the center. Usually, there are slices of a pork-like cold cut, that is reminiscent of classic head cheese served in many French charcuterie boards along with minced sweetly seasoned roasted pork, not unlike the ribs you would order from a Chinese take-out; very Asian. There are also other options ranging from chicken, beef, tofu, stewed vegetables, and curries. 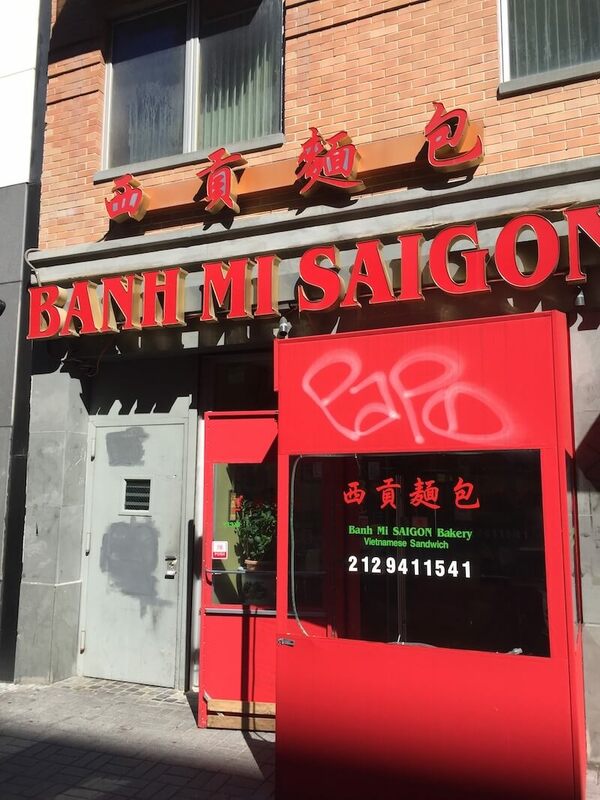 The secret started to spread through the neighborhood, and the business outgrew its space on Mott Street. It moved to the much larger, adjacent, Grand Street. There is still a jade stall at the front of the shop, but now much smaller, and the center of attraction is the Banh Mi Shop in the back. There’s now a counter for those who wish to eat in. The patrons are also a more diverse range and the old ladies are seen less frequent. The prices have tripled, but to me it’s worth every penny just to see that skinny guy behind the counter smile,and giving me the chance to remember some of the good times I had with my brother in our younger years in the neighborhood. The tavern had that yellow hue inside, and its rustic interior made everyone feel at ease. The day that had started warm, turned, and it made me happy that we had gotten seats at the warm bar. The de-rigueur seemed to have been well-worn flannel shirts, beanies, and thin-wale corduroys. I was going to start on my tangent about how I felt about hipsters, but the bearded kid behind the bar was nice enough to talk to us as we drank our “small batch” beers, that I decided to refrain. After a few beers, the bartender asked us if we wanted anything to eat, and as I scanned the menu board I read that they offered beef jerky. This wasn’t the first time. Beef Jerky, not the “Slim Jim” variety has fashionably made its way back into the mainstream via bars and craft coffee houses. However, in Chinatown, beef jerky had never gone out of style and still remains a humble snack made to be eaten on the go to satisfy hunger quickly. No foamed coffee, fancy brewed beers, or flannels here, just 2 women behind a small counter selling a selection of jerky. Beef, Spicy Beef, Pork, Spicy Pork, Chicken Spicy Chicken, etc. – you get the idea. Lots of choices. You can even watch them smoke the thinly sliced meats over a smoker grill. As upgraded the jerkys have become that are being offered in bars such as the one I depicted, they don’t hold a candle to the one’s served at “Singapore Malaysia Beef Jerky” on Elizabeth Street. Next time you feel a bit peckish or need a bite to eat after a few afternoon drinks. Make a stop here and find satisfaction in a sliver of smoked meat. 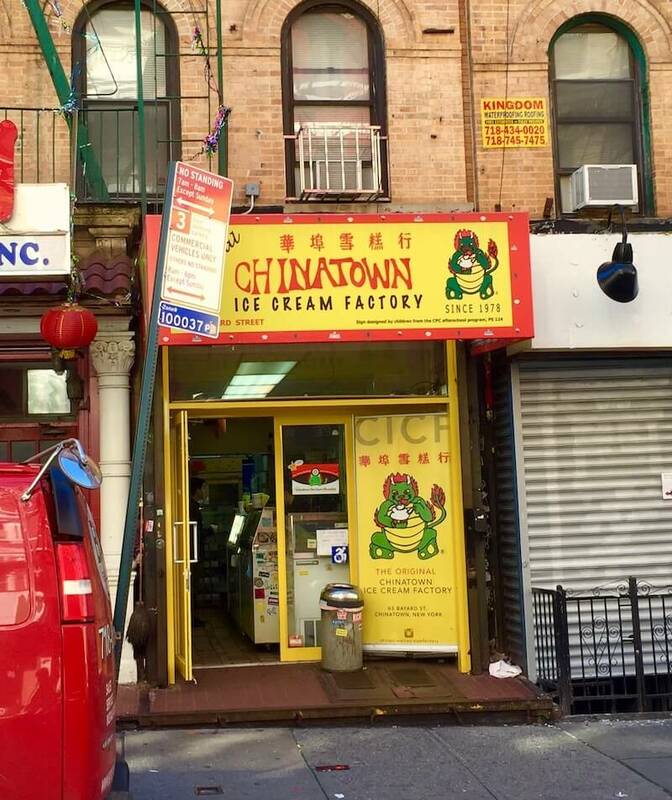 I’ve been talking about a lot of savory dishes, so for sweeter options go to Chinatown Ice Cream Factory – Exotic flavors such as Lychee, Taro, and even Durian are some of the local favorites. For another Ice Cream option, go North a few blocks into the old Jewish neighborhood and make a stop at “Laboratorio del Gelato” where there are also great unique offerings such as cream cheese and lavender flavored gelati. Xian Famous Foods redefines the slider. They offer a “Spicy Cumin Lamb Burger” and “Stewed Pork Burger” which are more akin to a gyro. These are some of the tastiest “quick eats” to be found. They used to have locations under the Manhattan Bridge and Baxter Street in Chinatown. Those days you can get these delectables for $2. Now located in the more posh NoLita neighborhood, the prices now match the rents. However, I still recommend a taste. 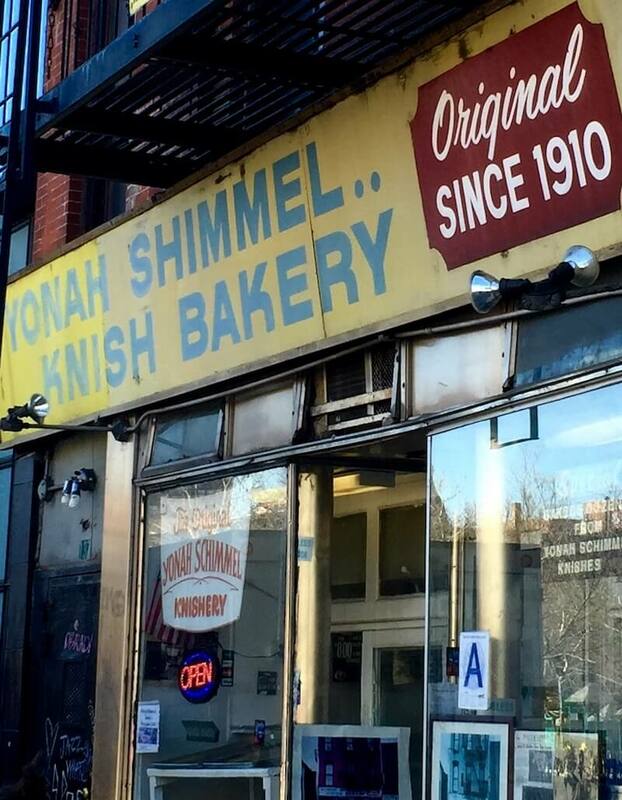 For a place that hasn’t changed their prices in some time, stop in at Yonah Shimmel in the Lower East Side for a New York staple – a knish. They serve more than just the classic potato; there are offerings such as cabbage, mushroom, beef (pulled corned beef), and even some sweet ones such as blueberry and chocolate. It’s an excellent stop; one that has been established for over 100 years. 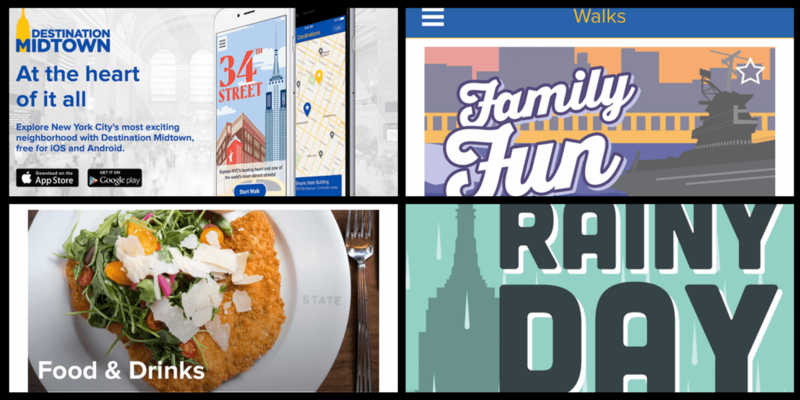 Bring your appetite and enjoy these haunts. It just may be the best tour you and your stomach have taken in a long time. Ready to visit New York’s Chinatown? Some links are affiliate links, which means we would receive a small commission if you use purchase anything but the prices remain the same for you. Thank you. That’s great. We love all the eats there. My sister is moving back to NY, I’m pinning this for my first visit! Love the vibe of Chinatown. Fantastic, Sherianne. Thanks for reading and have a great time with your sister in NYC. Mouth-watering. Haven’t been there and I’ve been to New York City many times!!! All of this food looks amazing. I suddenly have a craving for beef jerky. On the subject of jerky… I could totally imagine a Seinfeld episode of messing with the curt waiters at a Chinatown restaurant. Haha. Seinfeld certainly captures true New York experiences. Wonton Garden is certainly one off those places that could have easily been on an episode. Come down for some Jerky some day. Thanks for reading. One of the things that fascinates me most with NYC is the food. It all seems so divine and so rooted in culture and history. I would love to visit Chinatown for a more authentic experience, and to try some of these places (although I may not be brave enough to ask for another minute!) 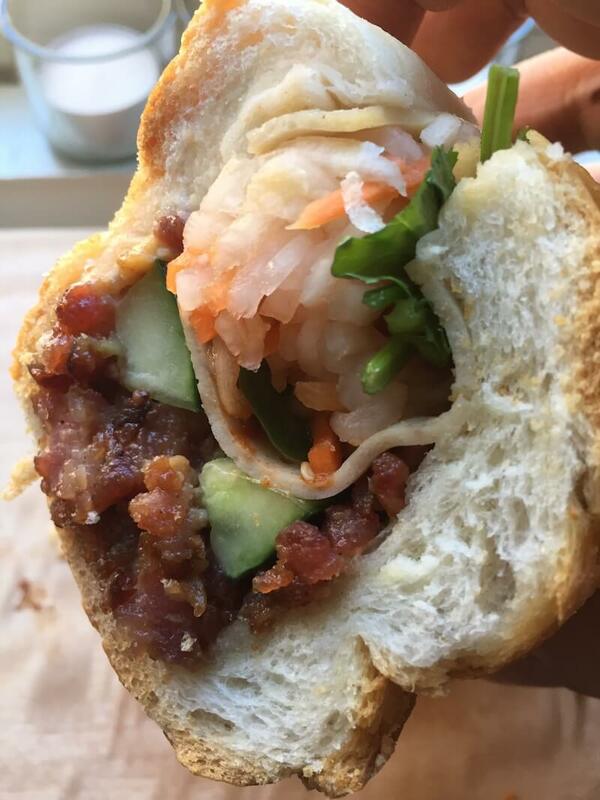 The Vietnamese/French sandwich looks straight up my alley! If you ever find yourself in New York, I’ll be happy to bring you to some of these places and make sure you experience the lovely rudeness of Wonton Garden. Thanks for reading. Thank you for reading Laura, enjoy Wonton Garden and let us know your thoughts when you have the dish. Love this post! I grew up in NYC and have been eating in Chinatown since high school. I knew some of the places already but am very excited to try out HK Wonton Garden and Singapore Malaysia Beef Jerky! Thank you for reading, HanNa! Please let us know what you think when you visit and try these dishes. You probably have some gems for us too.